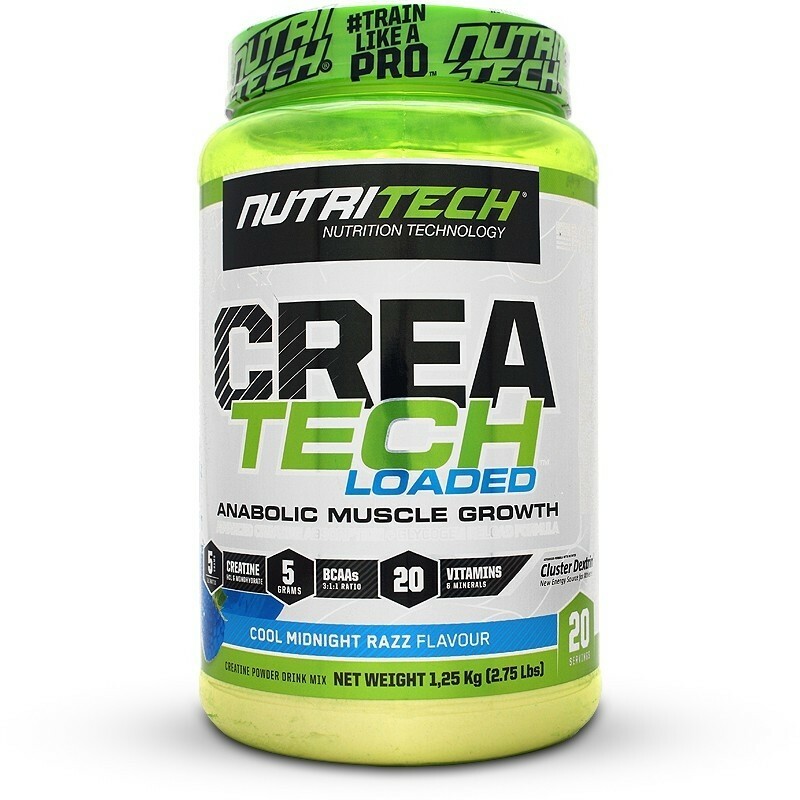 Nutritech Createch Loaded is a pre and/or post-workout supplement for lean muscle and training recovery. To maximise creatine absorption and reload glycogen stores each serving is engineered with a 45gram fast multi-stage release 4-source carbohydrate blend which includes patented Cluster Dextrin®. Cluster Dextrin® is a specialized carbohydrate compound which increases sarcoplasm levels in your muscles to deliver the Creatine payload. Being highly soluble in water, Cluster Dextrin® moves quickly through your stomach, to your gut where it is absorbed and pumped into your muscles. The creatine payload which assists with strength, recovery times and endurance is transported along. To get the best out of each rep you take, creatine gives you the edge. With the Createch Loaded formula you receive 2.5 grams of possibly the most researched strength and endurance sports performance supplement, Creatine Monohydrate. Combined with 2.5 grams of the lighting fast absorbent Creatine HCL. To build the muscle you crave, Createch Loaded gives enough ATP levels during critical times when working out, increasing your muscle energy for more strength and power. To assist with protein synthesis and increase muscle mass over time, each serving has a precise 3:1:1 ratio of the BCAAs L-Leucine, L-Valine and L-Isoleucine. BCAAs are a hard-gainers weapon for keeping the gains coming. To optimise your immune system during periods of hard training Nutritech have added 20 vitamins and minerals to keep you replenished. Anabolic Carbohydrate Multi-Stage Blend (Dextrose, Cluster Dextrin® (CCD®) (Highly Branched Cyclic Dextrin), Waxy Maize Starch, Maltodextrin), L-Leucine, L-Glutamine, Creatine Hydrochloride, Creatine Monohydrate, L-Isoleucine, L-Valine, L-Glycine, Taurine, Flavour, Citric Acid, Malic Acid, Silicon Dioxide, Vitamin and Mineral Blend (Vitamin A (Retinol), Vitamin B1 (Thiamine), Vitamin B2 (Riboflavin), Vitamin B3 (Nicotinic Acid), Vitamin B5 (Pantothenic Acid), Vitamin B6 (Pyridoxine), Vitamin B9 (Folic Acid), Vitamin B12 (Cobalamin), Vitamin C (Ascorbic Acid), Vitamin D (Cholecalciferol), Vitamin E (Tocopherol), Vitamin H (Biotin), Copper, Chromium, Iodine, Iron, Manganese, Molybdenum, Selenium, Zinc), Non-nutritive sweetener; Acesulfame Potassium (E950), Sucralose (E955), Colourant (E110 Summer Pine Crush, E133 Cool Midnight Razz, E104 Kiwi Pomegranate Twist). Mix 1 level scoop (approx. 62.5g) with 300ml of cold water in a shaker. Shake thoroughly and drink before or immediately after your workout. On non-training days, take 1 serving in the morning upon waking. Awesome product. I use during my sessions. Keeps me going.